Gosaikunda Trek | Adam Tours & Travel Pvt. Ltd. The Langtang Gosaikunda trek: This amazing Langtang Gosaikunda trek is especially designed with the combin of the remote and spectacular valley of Langtang. With the high mountain lakes at Gosainkund of the langtang is populated by Sherpa and Tamang families in the North West of Kathmandu valley and popular for its culture and religion with splendid views of Himalayas. The Gosaikunda area has been delineated as a religious site. Hindu mythology attributes Gosaikunda as the abode of Hindu deities Lord Shiva and Goddess Gauri. The Trekking trails of Langtang Gosaikunda are challenging which includes long, steep and descents, temperate sub- alpine deep forest, sky blue gentians, epiphytic orchids and primroses or across glacier mountain views and interesting villages. 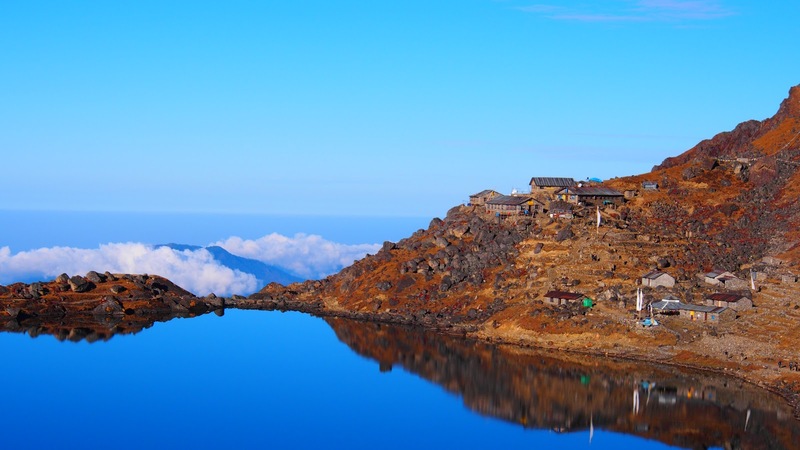 Langtang Gosaikunda hiking gives you the opportunity to get right in among the Himalayan peaks and to get off-the-beaten-track, walking through some fascinatingly remote and relatively unpopulated areas. The popular start to the trek to Gosaikunda is in Dhunche Village or Syabru Besi both from the Langtang side. Alternatively, trekkers may also start from Sundarijal, which lies on the outskirts of Kathmandu. . Many trekkers choose to stay at Laurebinayak which also provides excellent sunset and sunrise views of the Langtang and Ganesh Himal. The main inheritances of this region are Tamang and Sherpa, origin of Tibetan, whose religion, culture, languages and dress are similar to the Tibetan people. The craftsmanship, dress, traditionally built stone houses and the beautifully wooden carved goes back to hundreds of years reflect. The spectacular scenery of Mt. Langtang Lirung (7246m), Gang Chhenpo (6388m), Naya Kangri (5846m) and Dorje Lakpa (6966m) are worth able for the nature seekers and mountains lovers one hand and other hand 1000 species of flora and many wild animals such as Tigers, wild boar, red panda, pica, musk deer, Himalayan black bear, Himalayan thar (wild goat), rhesus monkey, common langur, snow leopard , hawks, hoopoe, cuckoos, barbets, owls, night jars, laughing thrushes, black-capped sibias, red-billed and parakeets etc. more than 250 species of birds are main attraction for the Langtang Trekking. Langtang Gosainkund trekking, gives the trekker a remarkable and varied journey through the Langtang valley and onto the holy lakes of Gosiankund. The trek climbs more steeply to Gosaikunda region through farmland and above the tree line up an alpine ridge that offers a huge Himalayan panorama, to reach a rocky bowl studded with scared high altitudes lakes. There are 108 lakes in this area but the most popular are Gosaikunda (4460m), Saraswatikunda and Ganeshkunda nearby each other. The Gosiankund lakes are considered holy by both Hindus and Buddhists alike and many Hindus make the pilgrimage to bathe in the lakes during the August full moon festival of Janai Purnima. It’s an easy trail with surprisingly amount of steep climbs and stiff descents, of the through deep forests or across glacial moraines through Ghopte to Chisopani to Kathmandu. Langtang Gosaikunda trekking offers an ideal trek for those without much time but wish to experience Nepal’s unique combination of cultures, landscapes, stunning mountains and diverse wildlife and vegetation. From lowland forests abundant with wildlife, to alpine meadows, pristine lakes, magnificent mountain views and a chance to sample the unique lifestyle of the local Tamang people, this is a truly memorable trek. We will meet you at Kathmandu Tribhuvan International Airport and transfer to your hotel. When you have had your time to settle in and freshen up after your long fight, you will be invited to visit our office for a briefing about your program. You will have meeting with your trekking guide and discuss about the equipment needed for the trekking and we will process for the trekking permits. If you arrive at night we will have same discussion in next day morning after your breakfast. The very next morning, after breakfast you will leave for a full day sightseeing tour around Kathmandu valley. You can visit sacred Pashupatinath Temple and Swyambhunath, very ancient and essentially enlisted in UNESCO World Heritage sites. The biggest Buddhist Stupa at Boudhnath and the fine arts and historical architecture of Kathmandu Durbar Square reflecting the ancient Nepalese culture are highlighted on our guided tour. On return to your hotel you will have time to explore the local area, have dinner and perhaps take a leisurely stroll through the popular streets. The trails lead us from Thulo Syabru follows a steep ascent path passing through Dursagang (2735m), passing aline of chotens. Along with the breathtaking views of Langtang Himal, Ganesh Himal, Tibetan Mountain, the trail continues steeply through the forests of oak and hemlock and then less steeply through rhododendron forest and pastures to the top of the ridge at Phoparng Danda (3190m). Watch the langur monkeys playing in the forest and a fine sunset views over the Ganesh Himal. The larger trail cuts across the ridge top, staying fairly level through silent moss-covered forests. Then the path gently ascends for a while and follows a flat level to the Sing Gompa. The local well managed cheese factory and a Buddhist Monastery’s can be the visiting places which provides panoramic views, exhilarating nature. Spend your night at teahouse. After explore around at Gosaikunda, we start a bit challenge day. The trail traverses the northern side of Gosaikunda Lake and climbs on a rocky trail. We climb through rugged country, crosses glacier moraines and past four small lakes to the Laurebina La (4610m). On a clear day we can see Annapurna range through the way. Then the trail leads us steeply down to Phedi (3740m). From here, the route drops to the stream then climbs through the scrub Bamboo to a crest. Continue walk down throughout crossing a rocky hill with pine, rhododendron trees to Ghopte. At night you can see the lights of Trishuli Bazaar far below and Kathmandu glow behind the hills to the west. Descending from the ridge at Ghopte, the trail makes numerous ups and downs across ravines and the boulders of old moraines. The trail slightly descends and then begins to ascend through the rhododendron, oak and juniper forests up to the Tharepati (3510m). Trek downhill with only one small ridge to cross en route. Stop at Kutumsang, an interesting typically old-fashioned Helambu village. Attractive Mountain views as well as local peoples’ life style, culture; customs would be worth making you glad. A pleasant walk down to the Pathi Bhanyjyang goes through forests. A shorter day but with descends and climbs to Chisopani, where the view of the whole central Himalayas is breathtaking. We can see Himalayan range from Manaslu to Everest. Landscapes will be reflective in the evening and early morning hours. We start the day by climbing up the last pass of the trek at Borlang Bhanjyang, at 2240m. From here we descend steeply through deeply eroded chasms towards the Tamang settlement of Mulkharka (1800m). More super views while descending to the road through oak and rhododendron forests, with some pine a lower altitude. Now it is a short trek to Sundarijal as we walk past the local water supply system and follow the water pipe to this village. From Sundarijal we can take local transportation, or have our private transport waiting for us to bring us back to Kathmandu for about 1 hour 20 minutes. Today is free or last minute you have few hour special shopping for your relatives. If you have more time you can do some shopping or sightseeing. We will drop you to the International airportto catch your flight back to your home and wish for your Safe journey. Guided Tour of Kathmandu City with expert tour guide and private vehicle. Alcoholic, hot ( tea & coffee) and cold drinks, mineral water, hot water. Personal expenses such as laundry, telephone calls, sweets, snacks, dessert, beverages and bar bills, camera battery charging. Tips for tour/ trekking staffs and driver. Best Travel Time: February – June, September – November are the best seasons. However, July & August are okay and trekking can be done but not so clear visibility due to rain. Trip Snippets: 17 days, 4 night’s hotels, 12 nights Lodges, Breakfast in the city and breakfast lunch & dinner in the trek is included. Your trek Back pack/duffle bag: Your baggage on trek will be carried by our porters, the maximum weight per trekkers is 15kg including your sleeping bag and down jacket, Other items not required on trek can be stored in our office or your hotel in Kathmandu.